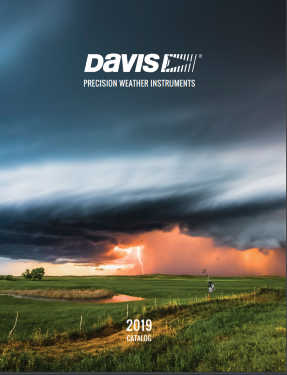 We have continued to expand the information available on this website with the aim of making it the most comprehensive source of information available on Davis weather stations anywhere. Please check through all the main menu headings here, especially under the Products and Advice headings, to find more details about the products you’re interested in. Pricing details for all Davis products will be found on our secure online shop at shop.weatherstations.co.uk. NB Prices are subject to change – Davis typically reviews prices on an annual basis and any significant change in $/£ exchange rates may require price adjustments at relatively short notice. A PDF copy of the latest official Davis catalogue can be downloaded by clicking the image at the right. (Be aware that this file is a LARGE 40MB download.) If you are a prospective customer and would specifically like to see a printed copy of the catalog then we do have a limited number of copies available – please email us with your name and full postal address to request a printed catalogue. We are happy to answer any technical questions but we do encourage such enquiries to be made by email rather than phone. If you do still prefer to phone then please note that we do always aim to have someone available to answer detailed technical questions during the morning and lunchtime period from around 0930-1330. But calls after this time may often require a subsequent callback, sometimes the next day.